The tour around the world has started with a bang, as we are going on a romp with the tourists. Join us on the flight to France as the first act walkthrough will take you there right after the jump with the first part! 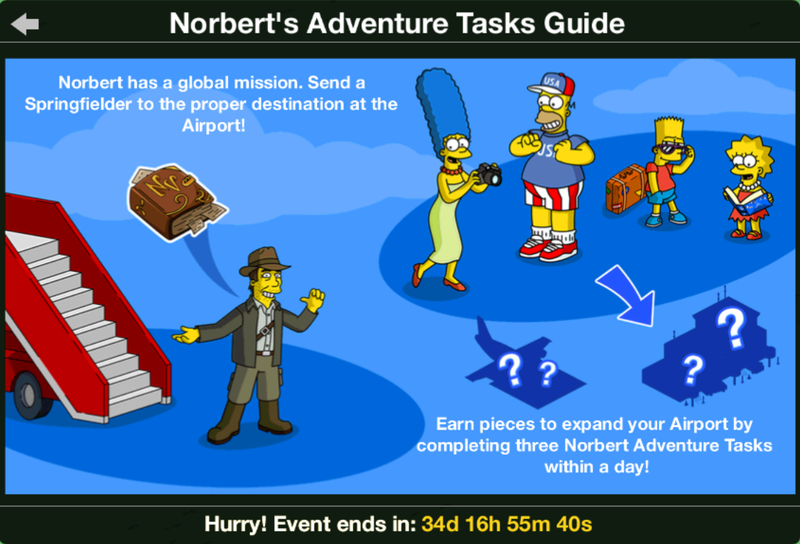 Once you login, the event quest will start immediatly, requiring just Homer, or, if you’ve Professor Frink, him too. Quimby: The success of Evergreen Terrace’s fake Chinese festival has given me a fantastic idea. Quimby: We make a bunch of little “worlds” – ChinaWorld, FrenchWorld, whatever – and pull in tourists who can’t afford to go to the real places. Marge: Like “Hepcat Center” in that Florida theme park I keep forgetting the name of. Homer: Or like “Westworld” without the killer robots. Professor Frink: If it’s deathbots you want, I have a self-aware toaster that’s in a pretty bad mood. Lisa: How are tourists supposed to get to Springfield, anyway? Lisa: We’re surrounded by impassable mountains, empty ocean, and an endless featureless plain. Homer: We could build an airport. Quimby: Perfect! The construction companies that fund my campaigns are ready for a boondoggle. Quimby: I shouldn’t say things like that out loud. Still, is it really news I’m corrupt? System Message: You got a Free Land Token. Buy land to redeem it. 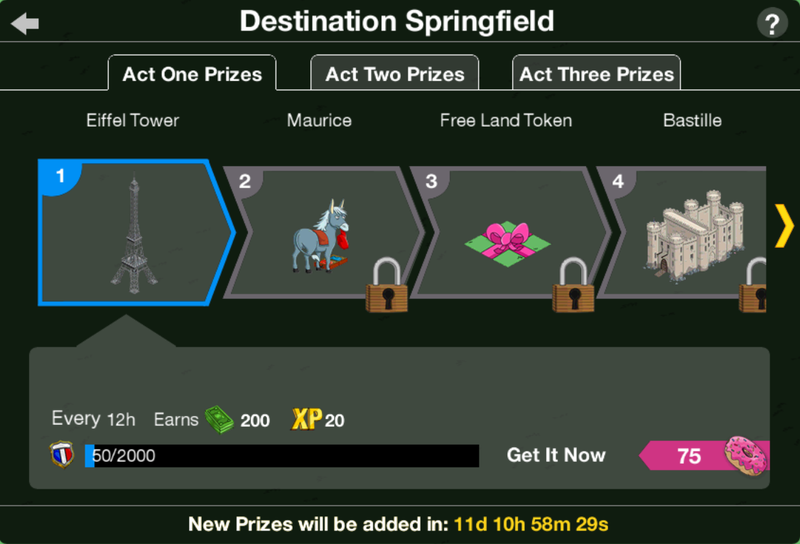 The Free Land Token can be used to unlock a plot of town for free! Moe: This is great. The airport just opened, and already the town is full of tourists. Quimby: I paid an air traffic controller twenty dollars to divert every plane within five hundred miles here. Moe: Smart. Now, let’s tap these tourists like maple trees for their sweet out-of-town syrup. Tourist: Hey, how come everyone here keeps tapping us tourists? Snake: Watch out. It’s how they distract you while they steal your wallet. Quimby: Our town is being flooded by American tourists who want to enjoy our cut-rate collection of fake foreign worlds. Quimby: As usual, Springfield’s triumph is America’s nightmare. Milhouse: Look! My uncle Norbert Van Houten, the international adventurer, just landed in his biplane. Norbert: When I heard you had a nice big airport, I knew I could finally fly in. Milhouse: But you said you once landed your plane on a Tibetan field the size of a postage stamp. Norbert: Riiight, that story. Well, if you’d had a postage stamp here, I would’ve come sooner! Kumiko: I just got offered a job as a flight attendant on Anime Airlines. Kumiko: As long as I wear the right costume. Comic Book Guy: Take the job. Bring me the left-over pretzel snacks. 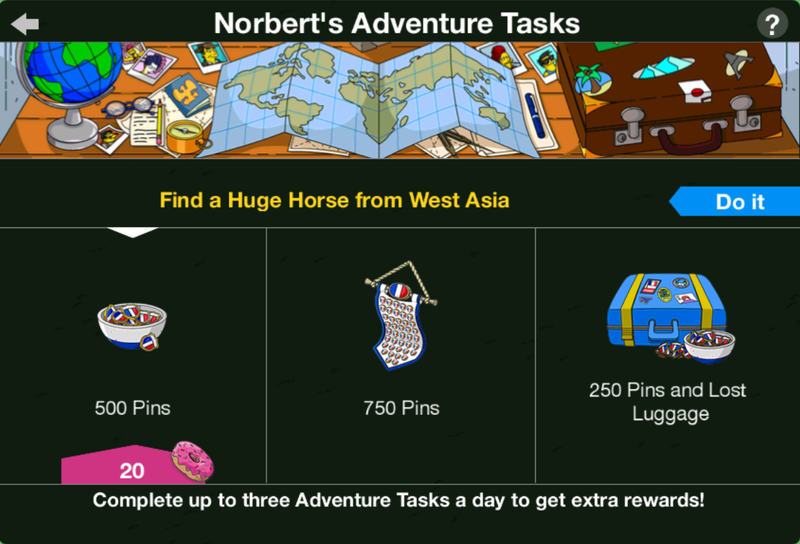 Norbert’s tasks can give you some awesome prizes for your airport and will eventually earn you Norbert himself. 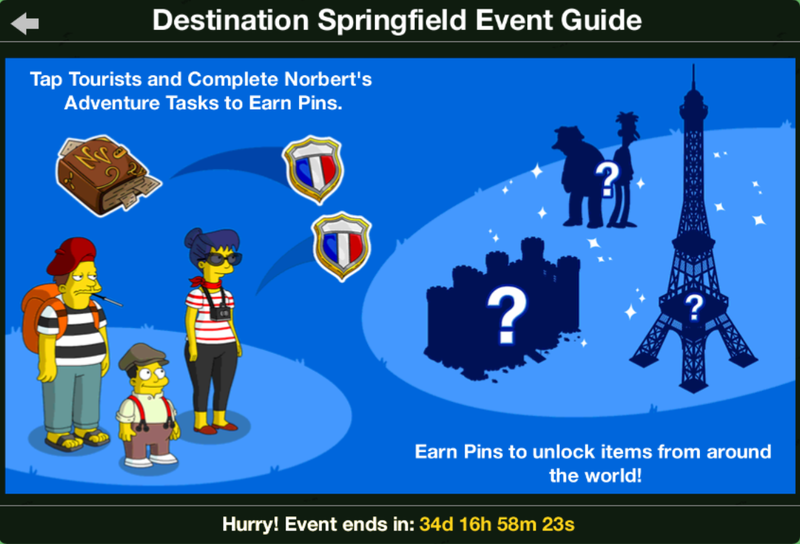 Just send Springfielders at the airport at the right location, with hints indicated in the task screen, to earn Pins and prizes. 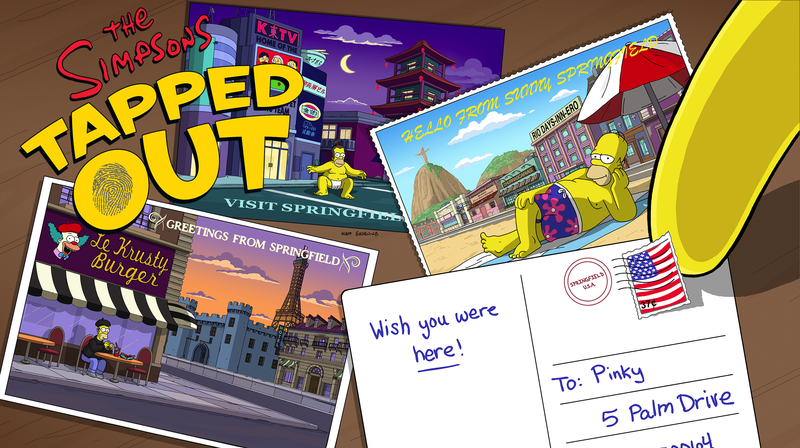 Tourist: Excuse me, sir, can you direct me to some of the famous sights of Springfield? Tourist: I hear there’s a Volcano Lair, a Ghost Pirate Ship, and Giant Mechanical Ants. Homer: Could be. Depends if Skyfinger was willing to pony up for premium items. Homer: Also, they tend to get moved around a lot. Homer: Some say a giant baby in the sky gets hold of our world and randomly slides things around while pooping. Quimby: Maybe. But maybe we just need a Tourist Information Center. 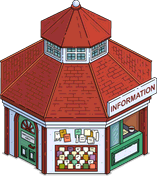 Using the Tourist Information Center, every 4 hours, you can clear your entire Springfield of all tourists and earn their currency. Moe: These tourists aren’t spending moolah at my bar. Moe: They’re just hanging around the airport trying to get flights outta here. Quimby: Good luck with that. I have flocks of geese flying around the airport to prevent departures. Quimby: But maybe we should go on a fact-finding mission to other Springfields, to see how they are encouraging tourism. Quimby: Wives not allowed on mission! 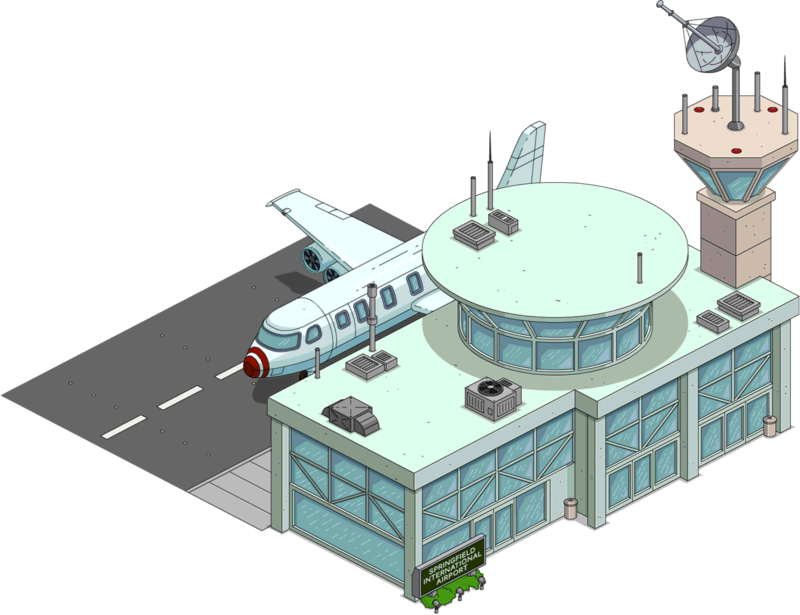 Homer: Springfield Airport is once again number one… in flight delays and lost luggage. Lisa: There’s a mountain of lost bags behind the airport. Quimby: Perhaps I shouldn’t have given the baggage-handling contract to the company that does city trash compaction. Homer: Well, as long as the original owners will never, ever get their stuff back, might as well trade it in for SkyCredits. My ticket timer after 3 is stuck at 0s and doesn’t seem to be moving.. glitch or is that normal? There will only be events in TSTO now. No more levels, only events. EA does not own the rights to Futurama game, ask Wooga. The timer for the flight tickets has gone up to 20 minutes after getting the 3rd prize, is that right or a glitch? Seems a long time .